After a short break when we had lots of much needed rain it seems that Summer is back. Yesterday we had 15 hours of sunshine…unheard of for Ireland. I went out just before 8 this morning to open the polytunnels…already serious heat had built up in there. 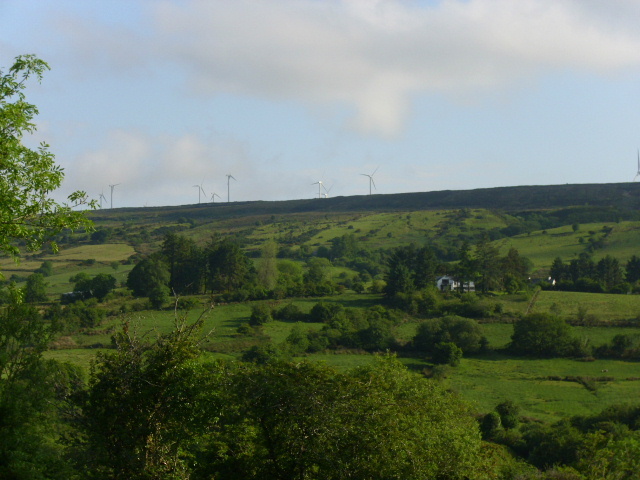 On the mountain the wind turbines are still. There’s not a breeze of wind to move them. The valley looks so lush at the moment. 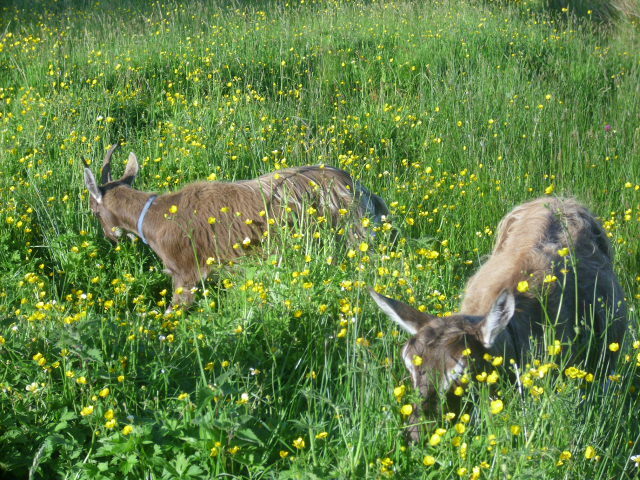 Grass is plentiful for the animals and they are enjoying the sunshine. I love how the farmers here have left lots of trees. 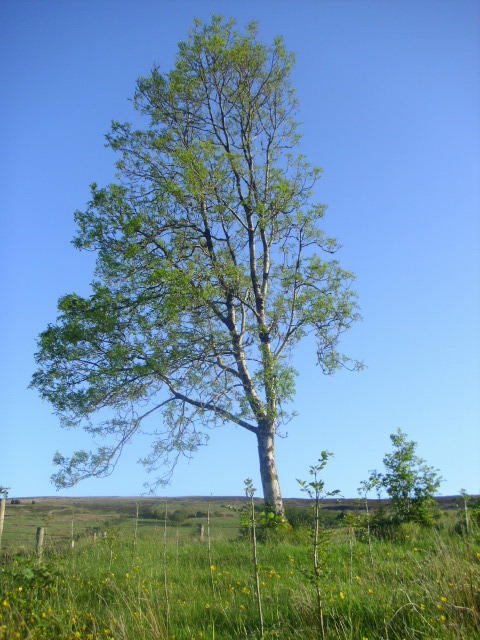 On large intensive farms one often sees all the trees and hedgerows removed to maximise grazing land. Electric fences are used to strip graze the land. This makes for a very boring landscape, no wildlife habitats and of course no shelter for the animals. 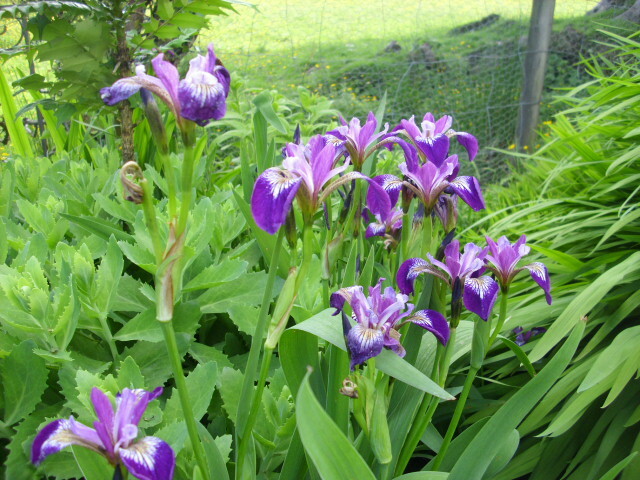 The Irises are in full bloom right now…it’s amazing how much these have spread. They were planted only last year. One to watch methinks in case it takes over. 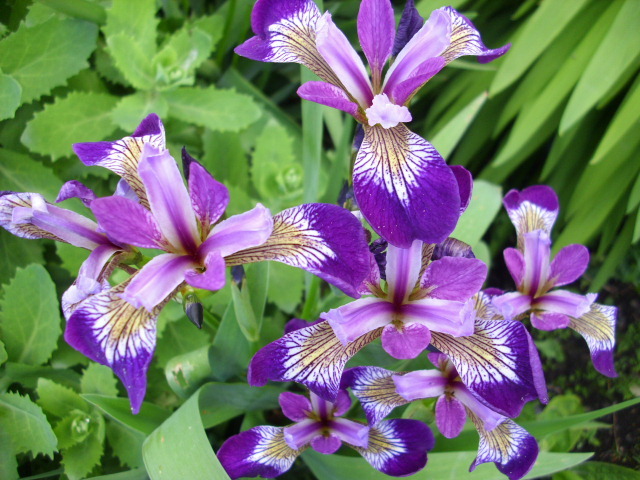 I just love their colour…purple being a fave of mine…and form…the beauty and perfection of Nature. Don’t know the variety of these…the label has long disappeared. 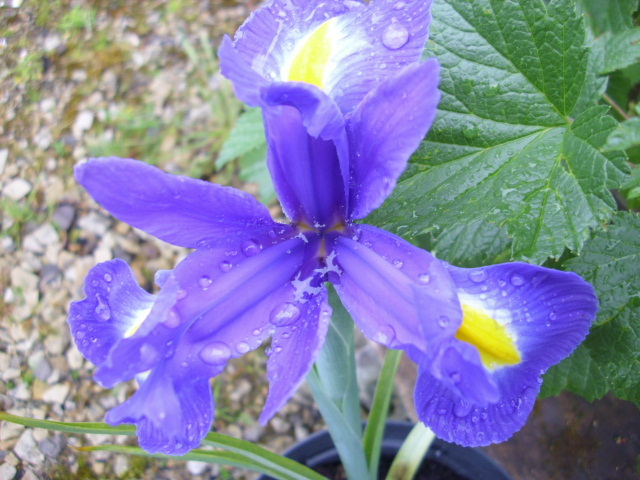 On another blog…can’t remember whose…there was a suggestion that rather than sticking the label in the ground by the plant that they were stored in the house or shed. A good idea I think as I can’t remember most of the names…and the labels blow away or disintegrate or the dogs chew them. 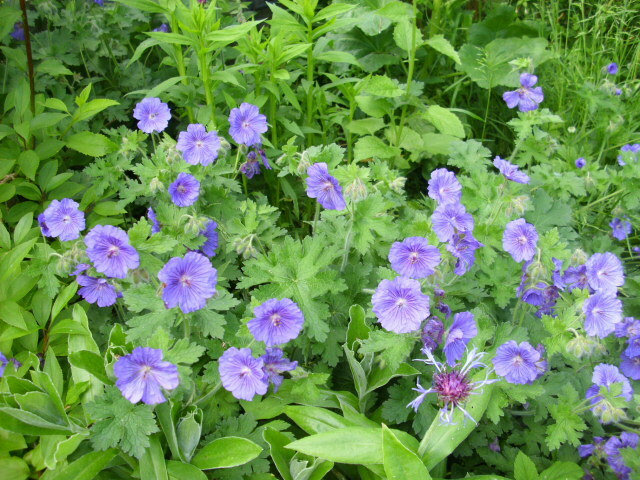 The perennial Geraniums have also come into flower. Deadheading regularly will keep these flowering for many weeks. 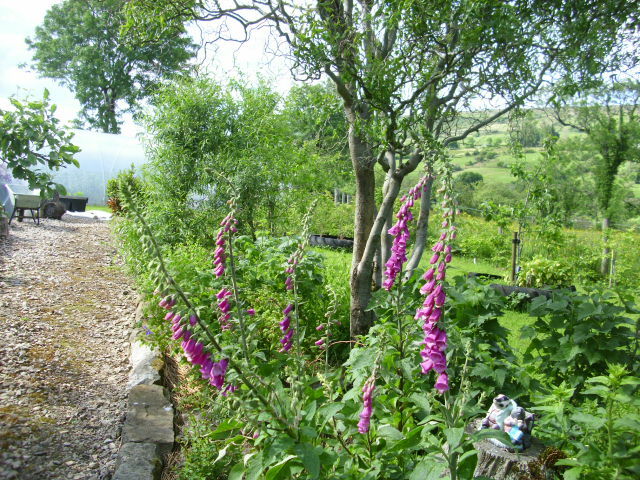 Foxgloves survived the wind and rain remarkably well. I thought they would be flattened. Plants are a lot more resilient than we give them credit for. 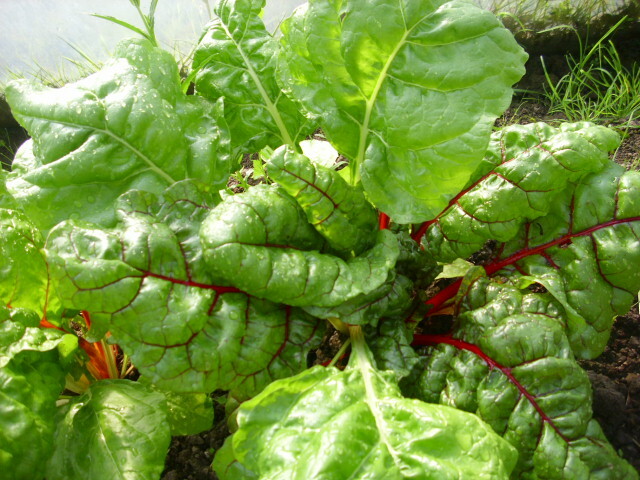 Swiss Chard seems to have become huge overnight. I just noticed this morning that this is ready for harvesting. I really love the leaves with the red ribs. Don’t they look fab…tasty too! All pics taken this morning around 8am. Everything is fresh and lush after the recent rain. It was much needed as everything was so dry and the water pressure in our well had dropped. The weather is still summery but without the very high temperatures we had at the end of May. We Irish are not genetically adapted to very hot weather. 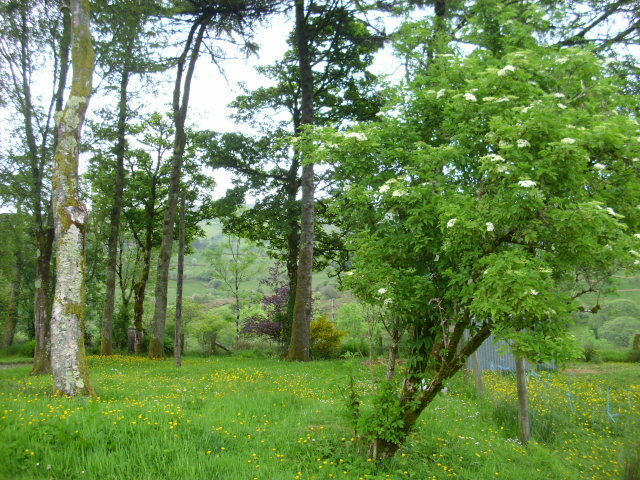 The Elder tree is just coming into flower here. Soon it will be time for cordial and wine making. Gooseberries and Elderflowers make a delicious jam combination. 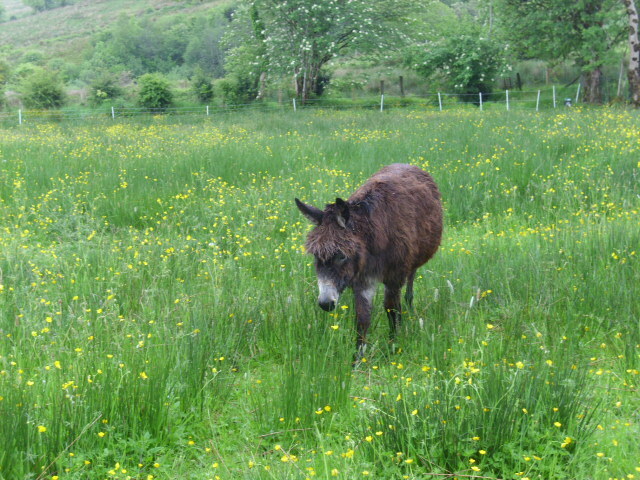 The fields are flush with grass for the animals. Does’nt Daphne look cute amongst the Buttercups? The Broom is giving a great colour show right now…it’s bright yellow so eye catching. In the past Broom was used in the treatment of dropsy…it is not used nowadays as the plant is considered too toxic. It is poisonous to animals but they don’t touch it anyway. It always amazes me how animals know instinctively what plants to avoid. 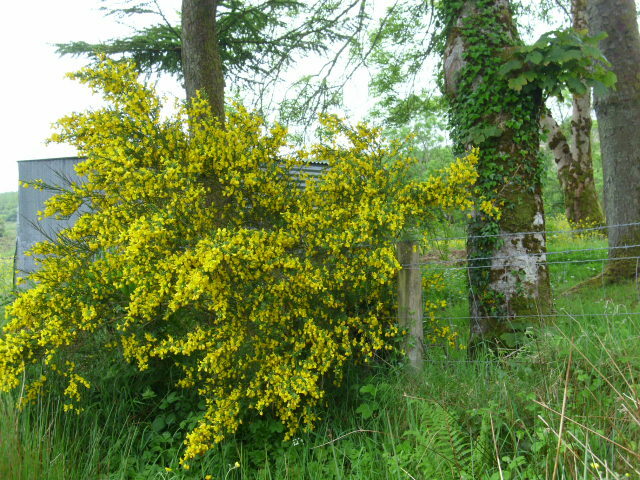 Broom grows in abundance by the river…I lifted this as a small seedling from the river bank 2 years ago and it has grown rapidly to this 5ft high monster. Considered a weed by many…I love it! The perennial Geraniums are starting to flower…they will give weeks of colour in the borders…especially if they are dead-headed regularly. 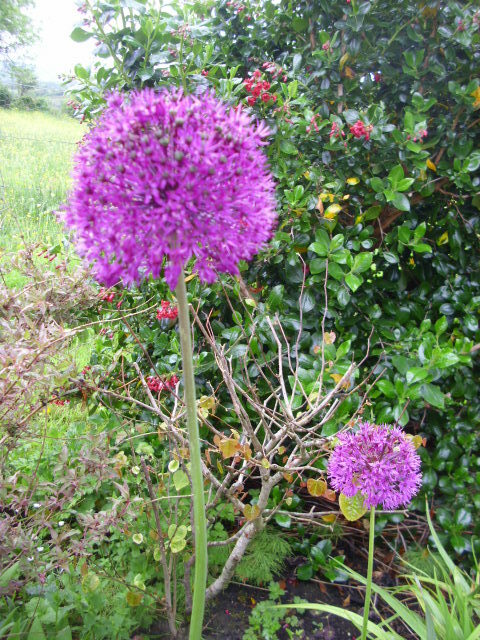 Purple is one of my fave colours so I really appreciate these Alliums flowering at the moment. I buy a few more of these bulbs each year. 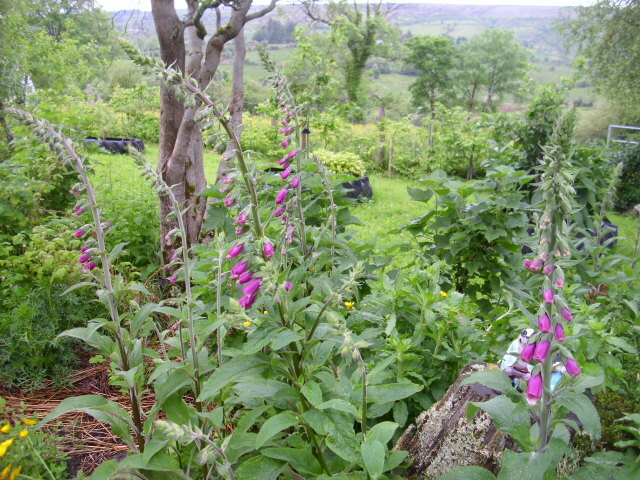 Foxglove is starting to reveal it’s gorgeous blooms…another weed…to some people… but one again that we allow to self-seed. 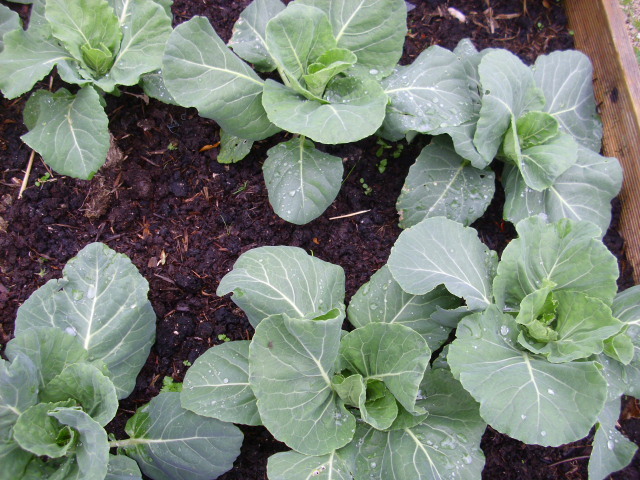 In the vegetable beds these Cabbages have put on a spurt of growth after the rain and warmth. Not long to wait until we will be harvesting these. Photos from the Morning Walk. The Irish weather is so crazy this year. Yesterday I took the dogs for their mornin walk wearing a skirt, tee shirt and a light shirt. Today I wore jeans, tee shirt, shirt and a sleeveless jacket. It’s about 10 degrees colder today. 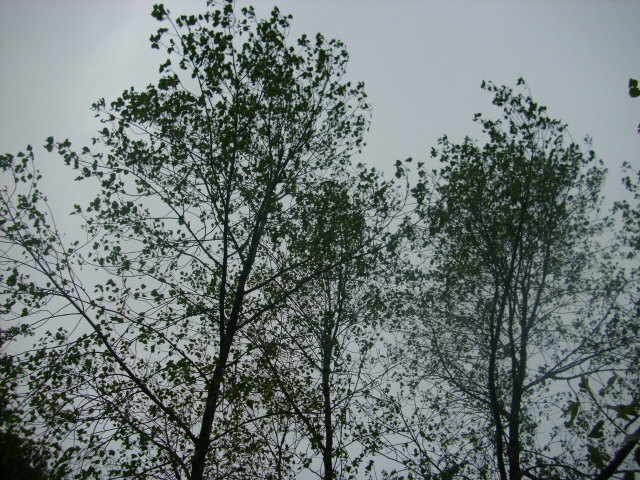 The sky was grey compared to the brilliant blue of yesterday. 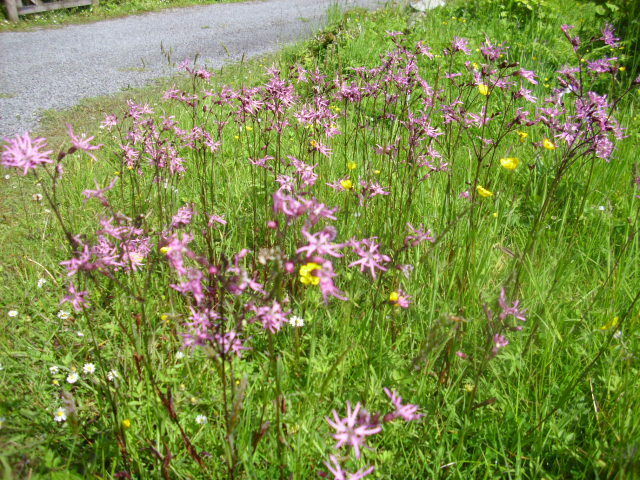 Lots of Ragged Robin in flower on the lane right now. It is my favourite wild flower. It likes the damp soil and unspoilt wild areas we are so lucky to still have here. It self-seeds readily. 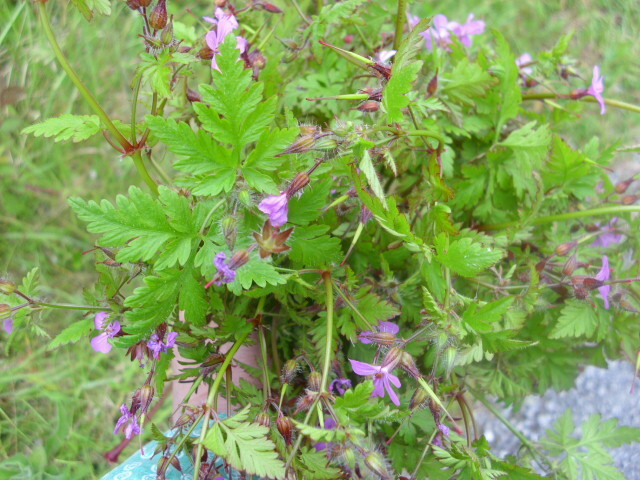 On the way back home I picked a bunch of Herb Robert. 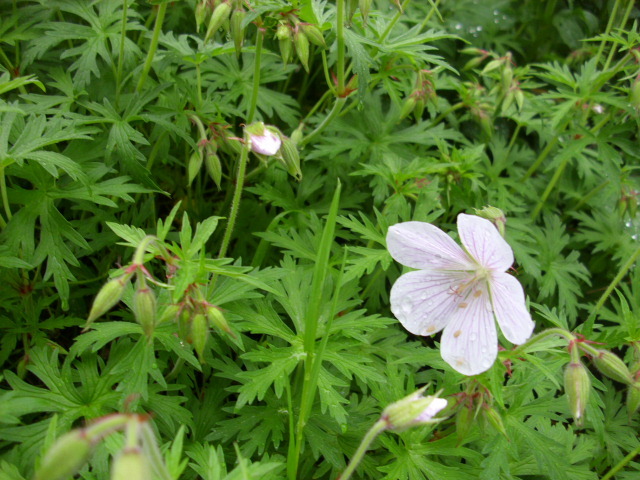 This little plant with it’s pretty pink flowers is the predecessor of the perennial Geraniums we now grow in our gardens. Made into an infusion and added to a footbath it is a great detoxifier. I will do this when the day’s work is finished. A simple indulgence free from nature. 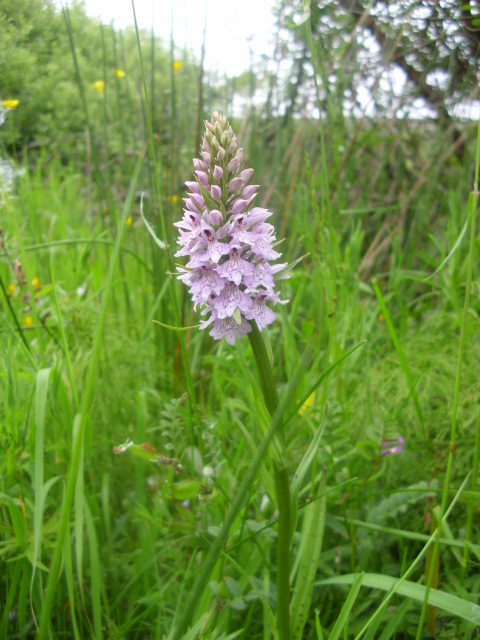 The native Orchid is flowering too. This is the first one I’ve spotted this year. Beautiful. Bella and Enid absorbed in breakfasting among the Buttercups. A remind of yesterday’s blue skies and energising sunshine. Hopefully it will return.